NEW TROLLEY STOP ADDED RIGHT NEXT TO HERITAGE VILLAS. BEACH GEAR IS ALLOWED ON TROLLEY. 100% REMODELED. 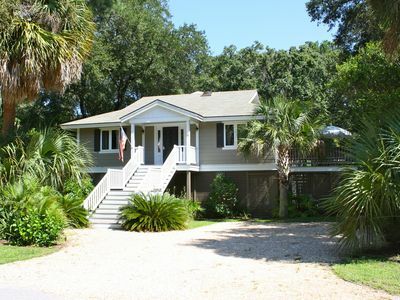 THERE IS NO BETTER 2 BEDROOM VILLA IN HARBOUR TOWN. DISCOUNTS AVAILABLE FOR STAYS OVER 1WEEK, CONTACT OWNER. 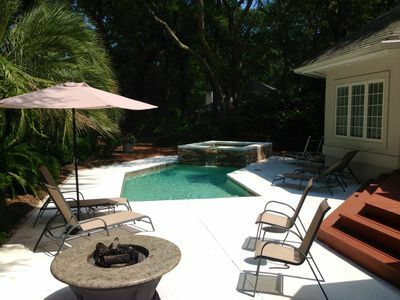 Thanks for considering our Villa for your visit to Sea Pines Resort. 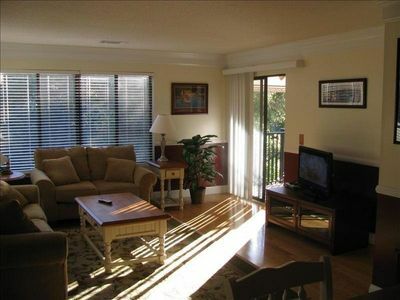 There is not a better, larger OR quieter 2 bedroom VILLA IN HARBOUR TOWN which is 1\8 mile away. Maximum occupancy is 4, Both bedrooms have king size beds. All interior and exterior pictures were taken November of 2018, There will be no surprises. 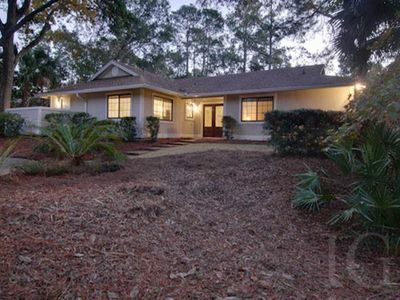 With 1600 square feet, HERITAGE VILLAS are the largest 2 bedroom VILLAS in SEA PINES. 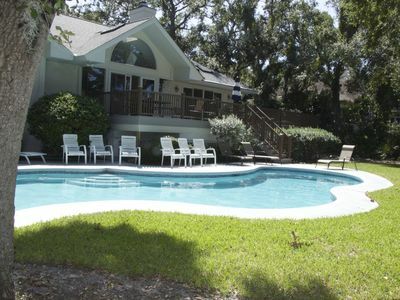 The Villa's end location is private, no foot traffic behind the VILLA , no road or golf noise. 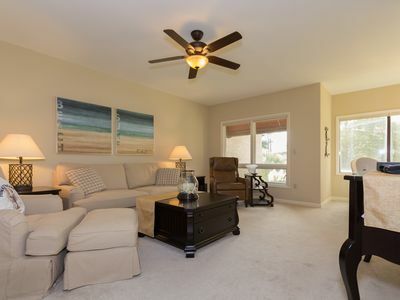 Villa has 2 king size master suites, both with private baths. Maximum occupancy of this VILLA is 4 people. Both suites have king size beds with hotel quality mattress Villa has over 200 channels, 3HD set top boxes, 17 channels of" Showtime" and 5 channels of "The Movie Channel". +Free Netflix.+ Free Amazon Video. Just added a Bluetooth stereo system. 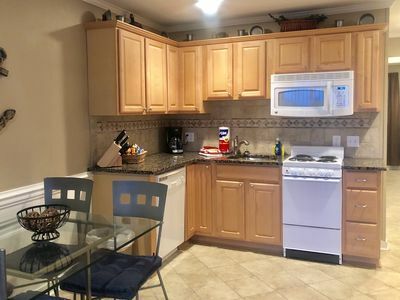 Our VILLA features two king master suites, both with fully remodeled baths upstairs. . both bedrooms have ceiling fans, flat screen HDTV, BLUE RAY DVD, NETFLIX. we have premium linens and premium amenities. one master suite has a king size bed, a very large closet and a 46 inch flat screen HDTV with over 200 channels and BLUE-RAY 3d DVD player. 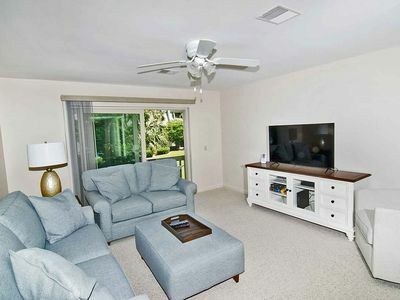 Downstairs in the living room is a new 55' flat screen HDTV with over 200 channels with BLUE RAY DVD player, that will stream complimentary Netflix or Pandora +Cinemax and The Movie Channel. Dining area has a large table that can seat 6, with a very private view. 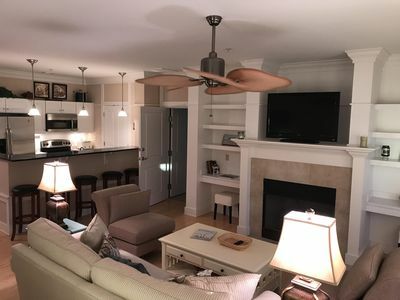 Completely remodeled kitchen has all new cabinets, appliances, we have wireless internet, premium linens, a supply of amenities and the largest private pool in Sea Pines. Recently this VILLA added even more privacy, the walkway to the pool which was located behind our VILLA has been rerouted and a fence is being put up at the end of our villa with landscape. there is not a more PRIVATE VILLA IN HERITAGE VILLAS. **No pets or animals of any kind allowed, no exceptions, please don't ask. 2019 potential guests, this past winter this VILLA had numerous upgrades. 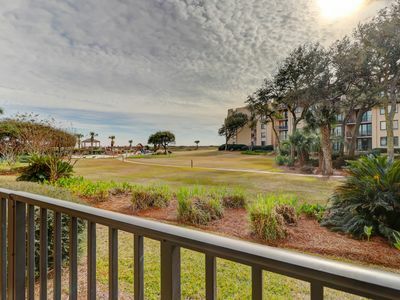 During your upcoming stay we proudly invite you to enjoy the fantastic new facilities and amenities at The Sea Pines Resort, including the Harbour Town Clubhouse, Plantation Golf Club, and Sea Pines Beach Club. The famed Harbour Town Clubhouse’s transformation honors the history of the former facility while taking it in a bold new direction, maintaining the course’s legendary reputation through such amenities as Links, an American Grill, a 1,900-square-foot pro shop and a breathtaking 4,000-square-foot locker room suitable for everyday players and professionals alike. The Plantation Golf Club, Golf Inc's 2015 Clubhouse of the Year, features stunning golf views and a beautiful, timeless atmosphere. Within this new facility you’ll find amenities such as the mouth-watering offerings of Live Oak, an expansive pro shop, and full-service locker rooms. 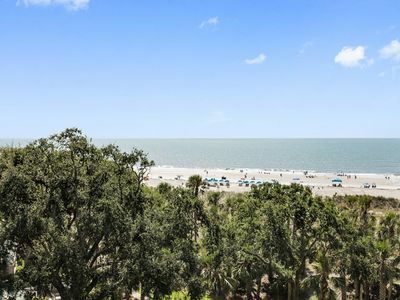 The family-favorite highlight of our new development is the all-new Sea Pines Beach Club. 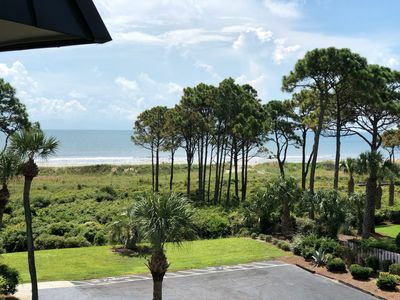 Featuring all of the premium beach amenities that visitors have come to expect, the Sea Pines Beach Club elevates the oceanside experience through dining options such as the upscale Coast specializing in fresh, local, sea fare, and the convenient Surfside Market. The covered decking of the exquisite second floor entices guests to take in the stunning views of the Atlantic, either outside or at the second-floor lounge area, Ocean Lounge. 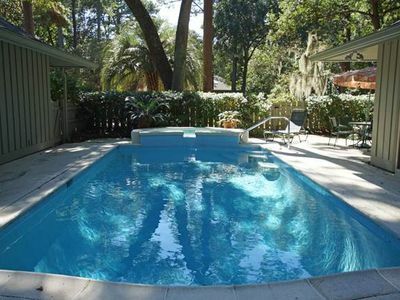 POOL: (no access fees)has had a major upgrade in 2015, there is no better or bigger pool in SEA PINES, it is surrounded by live oaks, tropical landscaping, comfortable lounge chairs, on site restrooms, outdoor shower and wifi availability for our guests. it is possible to arrange chairs where there is sun, shade or partial sun. pool toys are available for your use. children (and some adults as well) enjoy riding their bicycles to the pool and parking them in the bike racks. pool is conveniently located near the VILLA mailboxes. 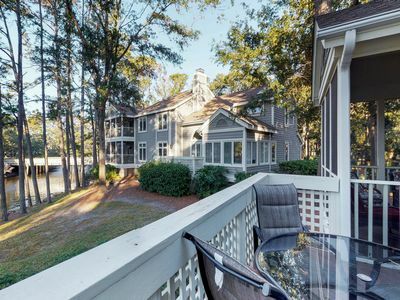 TENNIS: Adjacent to HERITAGE VILLAS, just a short walk to the SEA PINES RACQUET CLUB -- the state-of-the-art tennis facility at the sea pines resort and home to SMITH STEARNS HILTON HEAD TENNIS ACADEMY-- has grown into a premier resource for tennis enthusiasts. 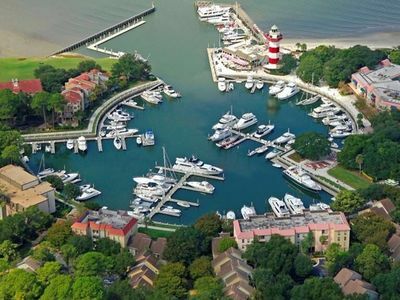 with a wide selection of teaching clinics and instructional programs, it's easy to see why tennis magazine ranked this world-class Hilton head island tennis resort as one of America's top destinations. 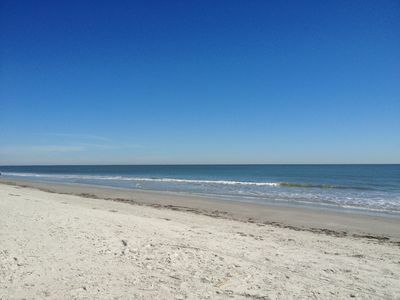 provides that service to sea pines beach club guests. 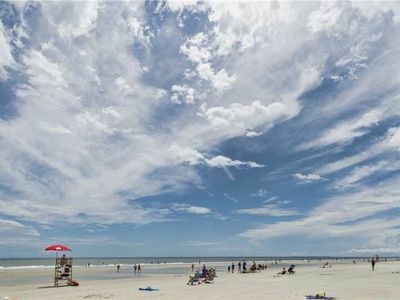 TROLLEY IN SEA PINES: The trolley offers you an easy, convenient way to travel around Sea Pines and visit your favorite locations. 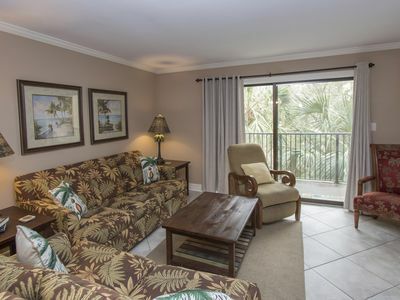 Closest trolley stop (about 2 minutes from our villa) is The Shoppes at Sea Pines Center. Take advantage of this complimentary service that operates 10AM to 11PM during the summer. Hours of operation varies during other seasons. 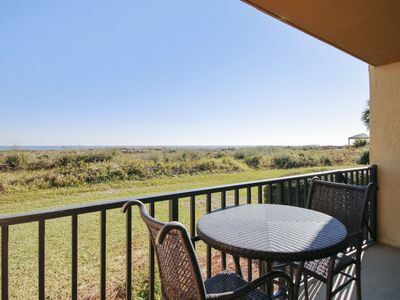 BIKING: Welcome to 20 miles of bike trails winding throughout this beautiful community and connecting every major activity area within the SEA PINES . 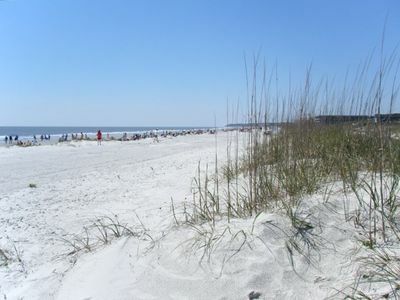 these paths will lead to such sites such as the forest preserve, Lawton stables, HARBOUR TOWN, SEA PINES CENTER, SEA PINES BEACH CLUB, SEA PINES CLUB, STONEY-BAYNARD RUINS and SOUTH BEACH MARINA VILLAGE. discounted bike rental with free delivery and pick up is available FROM RIDING TIGERS BIKE RENTALS. Please call ahead so bikes will be at the VILLA when you arrive. please mention discount. HOUSEKEEPING: Premium linens, thick and thirsty towels, and higher end amenities which are included in the cleaning. no extra fees for linens or towels. no need to pack sheets and towels to bring with you. beds are made and ready for a great night's sleep when you arrive. this choice villa is stocked with all of the household amenities needed for a weekly stay, including trash bags, dish soaps, bath tissue, soap, supplies..
OUR INDEPENDENT VILLA INSPECTOR is a retired engineer that will make sure everything is perfect before your arrival and is available to assist with any maintenance issues that may occur during your stay. contact information is provided in your vacation packet. SECURITY: New for 2017, there is a hotel quality safe installed for your added piece of mind. $500 deposit for stays up to 2 weeks. Stays greater than 2 weeks require a $600 deposit. Advance payment will be applied to Villa rental, final payment must be made as follows. Stays 1 month + 120 days. Discounts: Discounts are available for stays over 1 week and times if your arrival is 30 days or less and our Villa is available. 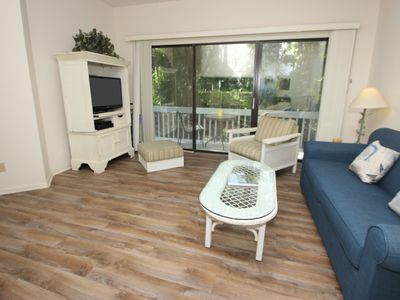 First Floor Condo - One Block from Beach - Bikes Included!